Often tallit buyers who opt for techelet for the first time are unsure about the various tying customs. For Sephardim, we follow Ptil Tekhelet Association's recommendation that they adopt the Rambam tying custom (right), also known as Yemenite tzitzit. We normally follow the custom of making 7 chulyot, but can tie 13 by request. For those who prefer the traditional Sephardic tying custom used for all-white tzitzit, we can tie this way by request. For Ashkenazim we usually tie techelet either according to the Arizal (right), which looks much like regular Ashkenazi tzitzit tying with a 7-8-11-13 windings pattern, or else according to the Vilna Gaon or Sefer HaChinuch. 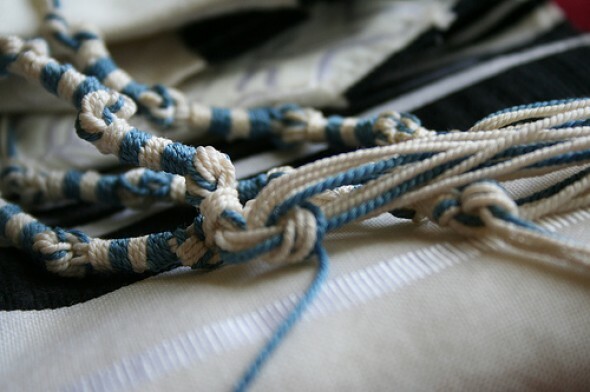 Vilna Gaon and Sefer HaChinuch tzitzit look quite similar, with alternating segments of white and blue chulyot throughout. With the Arizal tying custom, all of the twists are blue. Also, according to the Arizal you wind up with seven white strings and one blue string, whereas with the Vilna Gaon (click here) and Sefer HaChinuch (right), you end up with six white and two blue. 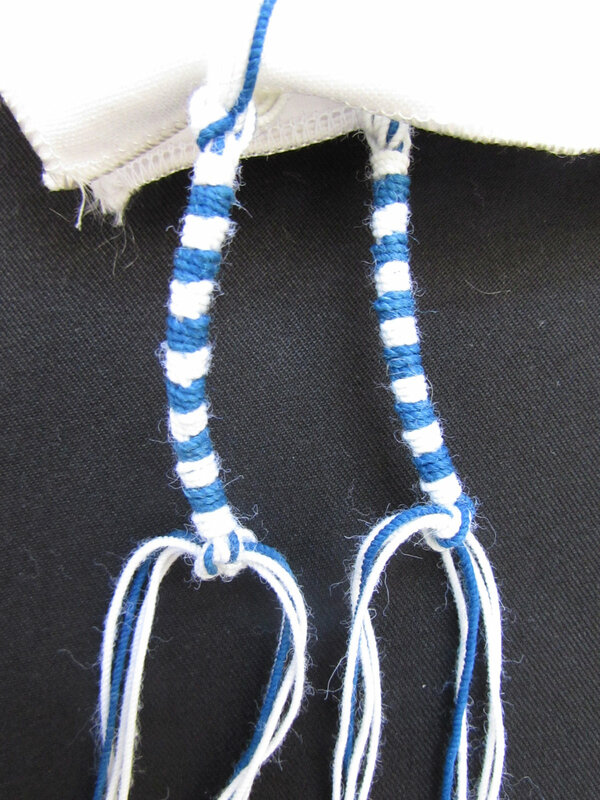 A fifth option is the Raavad tying custom (right), which consists of seven wraps of alternating blue and white in the first, third and fourth chulyot (segments), while the second chulyah is all white. Note that the term "Raavad" can be a bit confusing, because when sold separately Ptil Tekhelet tzitzit strings come in two types: Rambam and Raavad. The Rambam type is used not only to tie Rambam, but also Arizal (sometimes referred to as "Radzyn" or "Chabad"), and likewise the Raavad type is used to tie not only Raavad, but also Vilna Gaon (or simply "Gra") and Sefer HaChinuch. The sixth option is Tosafot, which uses two full strings of blue on each corner, and consists of just seven chulyot. Because this approach uses twice as much techelet, the cost is significantly higher, but we keep the price down as much as possible. Finally, some of the other less common tying methods include Amram Gaon, which has 7 or 13 chulyot in a single unbroken section, and Baal HaItur , which has 13 chulyot with a double knot after each one. We do not offer these as standard options, but can always accommodate special requests. Buying tefillin: Peshutim or Gassot? Should the tallit neckband include the Tzitzit Blessing?